Go Visit this Beautiful City and Restaurant by Selecting the Button To The Left "Want Name/Address." An incredible opportunity to make $100k+ per year, own the building, have free living quarters as well as rental income. 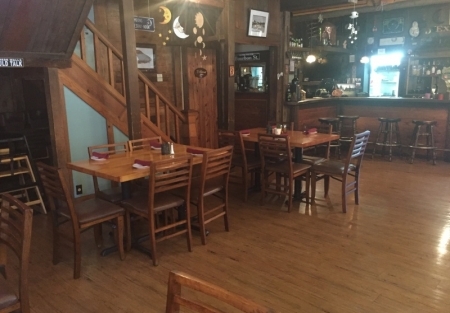 This restaurant with real estate is situated in the beautiful Western Sierra Nevada's of N. CA and is located just 70 miles from Lake Tahoe and Reno, Nevada. The restaurant is a locals favorite and has been operating since 1949 with three main families at the helm. It is the oldest eatery in this historic town and the interior has a funky, rustic and cozy ambience featuring two main dining rooms and a large outdoor patio that blooms 7 months of the year. The restaurant features a beer and wine license and an eclectic menu with pizza, pastas, entrees and grilled items. There is a HUGE bonus too. There is an apartment (with a separate entrance) upstairs and a studio apartment behind the main building. Live upstairs and have a mother in-laws quarters out back or rent them out and potentially add another $18,000 of annual income. There is also a small garden area for fresh herbs and veggies.There is ample street parking and an adjacent parking lot across the street from the restaurant. This small towns main industries are tourism, outdoor recreation and timber. The weather is mild much of the year and there are four distinct seasons with brilliant colors in the Fall, wildflowers in the spring, snow sports in the winter and hundreds of streams as well as major lakes for water sports in the summer. Sales have grown steadily each year: 2014 = $397,000. 2015 = $427,000. 2016 = $434,000. 2017 = $445,000. SBA LOAN is available for this business, making this an affordable investment. 2017 Working Owner Cash Flow before financing costs was about $100,000 + per year. Potential to make even more if you have "industry" experience as current owners had no prior restaurant experience. Put 20% down of about $100,000 and the monthly principle and interest will be about $3,400 depending on the mix of real estate value versus business value. For purposes of this ad, business value is estimated at $159,000 and the real estate value is $300,000. To qualify for an SBA loan one must have at least 5 years restaurant management experience, good credit, good tax returns as well as proof of the down payment in the bank for past 3 months. 7 Days a Week Summer 5 - 9"ish"
5 Days a Week Winter 5 - 8:30"ish"